Maybe it’s because I spend a lot of time creating content for this blog and social channels such as Instagram, but I’m pretty aware of the fact that the “perfect shot” takes time to capture and that the final product is only part of the whole of someone’s life. For those people who don’t deal with the behind the scenes of a million images, messy food shots, pre-image conceptualization, and editing, it may seem that those people you follow on social media live a picture perfect life. I think we’ve all been told not to compare our behind the scenes with someone else’s highlight reel, but it can be hard not to get caught up on days when we might be feeling down, vulnerable, or simply overwhelmed. It’s important to keep that saying in mind when we may be having a tough day, but it’s also important to be proactive when it comes to your social media. Here are some of the things that have helped me make it a fun and safe space for me. Remember that you have control over what you choose to see, so choose to make it a positive experience. Anytime I find that an account leaves me feeling less than positive after viewing it, I tend to simply unfollow them. It’s not always immediate, as I can get used to just scrolling through the same accounts, forgetting why I followed them in the first place. After some repetition of negative feelings, I’ll ask myself why I am following them and if it’s really adding to my life. If the answer is no, I unfollow and move on. With the addition of stories came the addition of the mute feature, which allows you to not see content from that account any more without actually unfollowing. You can choose to mute their stories, their posts, or both. Sometimes I love the beautiful imagery created by an account, but don’t derive much from their stories, so I will select to mute them. Assess how images and interactions make you feel and decide what’s appropriate for you. Some of my favorite accounts are those that inspire me to be more creative, think outside the box, and embrace who I am. Find accounts like that for yourself. Don’t waste time with anything less. There are MILLIONS of accounts on Instagram and I’m sure you can find the ones that help you lead a better life. As a sidenote, would you guys be interested in a round up of some of my favorite IG accounts?? One of the things that I’ve found helps me connect with followers is to actually share my behind the scenes. I’ve been amazed at how many people respond to me sharing difficulties I’m having currently or in the past. I think we all forget that people tend to shy away from sharing the bad times, and we assume that they must not have any. Next time you experience something negative, share about it! Don’t share in a way that makes it seem like the world is out to get you or that you’re trying to make others feel sorry for you; share with a solution to your problem or at least a mention about how you plan to have a better day, work towards a solution, etc. You’ll be surprised at how many people your honesty resonates with. I have made friends through social media much easier than I have in real life. I can’t tell you how many conversations have started, which led to actual friendships and meeting others. It’s almost easier to make friends online because you get a glimpse of who they are and what they like before you may even say a word to them. I’m able to tell pretty quickly if we would get along and if it’s someone I’d like to get to know better. If there’s someone you’re interested in getting to know better, say something! Comment, send DM’s, and just get the conversation going. You never know how much they can add to your life. If you’re still struggling with social media, maybe take some time apart. Delete apps from your phone so that you’re not tempted to go back on. Take a break. Spend time away from your phone and simply living life. It’s amazing how refreshing a break can feel and don’t worry — it’s not going anywhere. 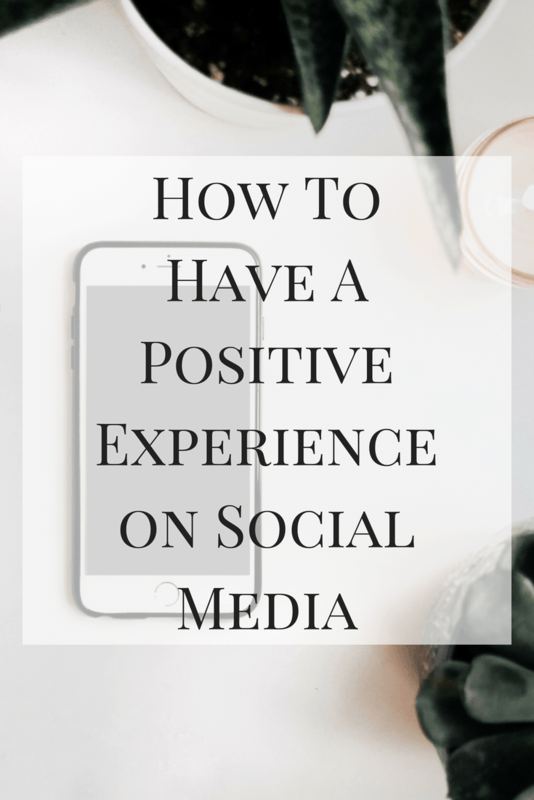 Here are some of my tips to have a more positive experience on social media. What are yours? I would love to see some of your recommended favorite accounts! Would love to see your favorite accounts! I’m always looking for new ones that will help me keep a positive attitude. I hope you find your positive way!